My thoughts and prayers go to those who had lost their lives, who had lost loved ones and who had lost their homes by the earthquake, tsunami and nuclear power plant disaster in Japan. 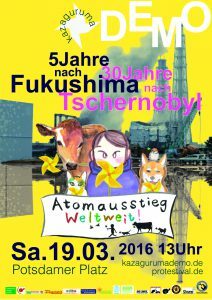 This year will mark the anniversary of the Fukushima nuclear disaster and the 30th anniversary of the Chernobyl disaster. Do you remember the horrific pictures of the explosion at Fukushima Dai-ichi nuclear power plant? Trillions of becquerels of radiation have been diffused and contaminated water has been running into the Pacific Ocean. The government doesn’t know yet what to do with increasing radioactive waste and countless bags of decontamination waste are stored in eastern Japan. Approximately 80,000 people still live in temporary housing as their homes remain uninhabitable due to radioactive contamination. Chernobyl proved that long-term exposure to even very low levels of radiation can cause health damage. In Germany eight reactors are still in operation and the recent accidents of Belgium’s aging nuclear plants worry neighboring countries. After Fukushima, Europe is now again faced with danger. There is no official accusation of TEPCO, who is responsible for the accident. Without learning its lesson from the Fukushima disaster, the Japanese government is eager to restart nuclear power plants and has just restarted four reactors. Many of the Fukushima evacuees will have to choose to return home as the government will lift the evacuation order in 2017. This also means the government will no longer have to pay compensation to evacuees. Instead of securing continuous fair support for the evacuees, Japan is going to pour 1.8 trillion Yen (15 billion euros) into the Tokyo 2020 Olympic games. Not only that, Japan is selling nuclear technology to India, Turkey, and Vietnam and the major Japanese manufacturers of nuclear power plants are trying to make profits outside of Japan, together with European companies. I fled from my home and am currently living 80km away from the nuclear power plant. We are facing a huge dilemma – we will soon be forced to move out from our temporary housing. Due to political decisions we are being forced to return home, but I’m very concerned about radioactive exposure and I’m worried about whether we can earn enough money to live on. It makes me angry when I hear politicians discussing sending us back home. I think they are taking radiation issues too lightly! 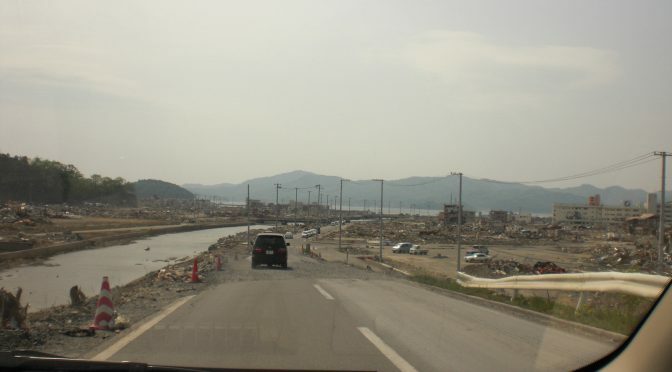 They decontaminated the residential areas and the government announced the lifting of the evacuation order because they said that the level of radiation has gone down. But do you think anyone wants to live in a place surrounded by bags of radioactive decontamination waste? When Tokyo was selected for the 2020 Olympic games and Japan was full of excitement about that news, I felt that something was terribly wrong. I felt that the suffering and the pain of those who were affected was totally ignored and I felt hurt by the TV coverage that acted as though the nuclear accident never happened. I try not to think about the Olympics and I don’t want to watch the news because I believe it is manipulated. We forget easily what we can’t see. But the invisible radiation continues threatening our planet and lives. Leaving a negative legacy of unsolved nuclear waste for future generations is no longer ethically permitted. 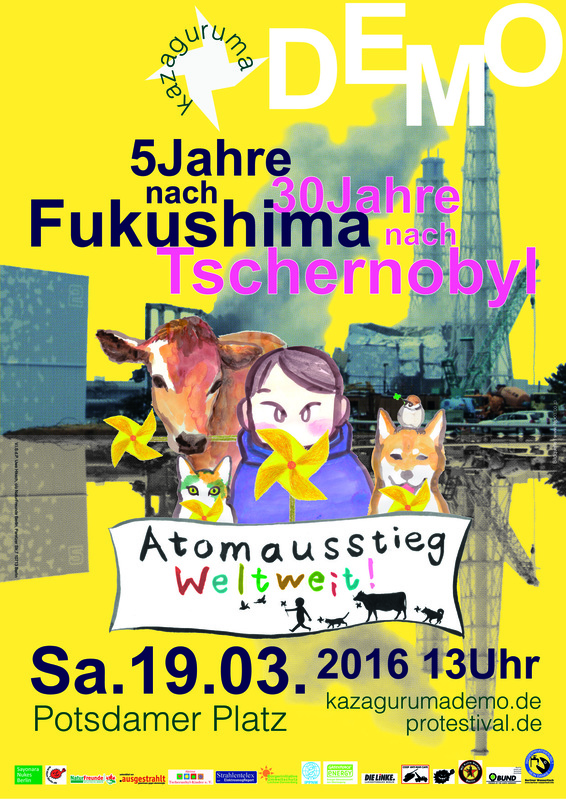 Nuclear energy and human beings cannot co-exist as Chernobyl and Fukushima testified. The energy transition in Germany is not enough to solve global issues. Until all nuclear reactors are decommissioned and uranium mining is stopped worldwide, we will be faced with danger. If you feel that nuclear energy isn’t necessary, say it out loud! Every one of us is a part of political decision-making. You might think your voice won’t be heard, but all our voices together can make a difference.